The metal working is an ancient art. There are witnesses that, already millennia before christ, metals were known and worked. Let’s just remind the previous gold and silver jewels that we find in so many museums, dating back to the fourth-fifth millennium b.c. considering that the evolution of the metal processing depends on several competences: chemical, physical, technological etc. It is easy to understand that it is extremely complex. The material working by plastic deformation started in the prehistory through the cold use of metals present in nature at the native state, like gold and silver. Afterwards, with the introduction of the possibility of melting materials, they passed to copper, bronze and more recently steel. It is certainly the latter that has had a more complex history, as a matter of fact, the methodologies for the production of precious metals, of copper and bronze have not conceptually changed since ancient times. On the other hand, the introduction of aluminium among the metals used in production is so recent, half of the ninetieth century, that it is difficult to talk about its history. The introduction of the iron use in the manufacture is so important that it has even given the name to an era, exactly “the iron age” that, started about one millennium before Christ, continued until few years ago, some in fact affirm that about fifty years ago we entered “the fossil fuel age””. Until the Middle Ages, steel was obtained with an extremely simple process. They used primordial furnaces, essentially some holes covered by clay, where they piled alternated layers of iron ores (mainly oxides) and charcoal. Once ignited the fire, it was fed by an apposite ventilation to increase its temperature that did not anyway exceed 1,200 degrees and then insufficient to liquefy a steel. Vice versa they obtained a reduction of the iron oxides in practically pure iron, which at the end of the process appeared as a spongy mass mixed with scales and slags. It started at this point a tiring process of forging and successive heatings of the mass to separate iron from impurities. The result was very mild steel, easily workable, called also “wrought iron” that was supplied in bars. 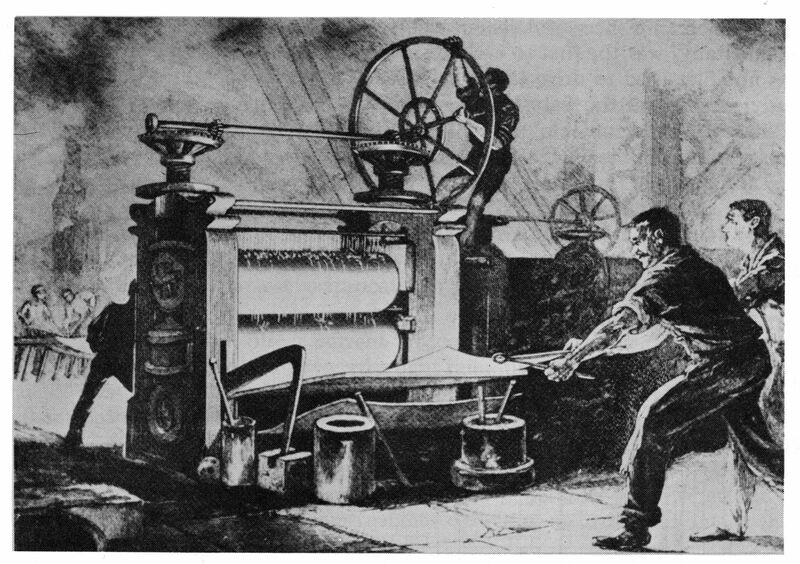 One of the techniques most used in Europe to increase the carbon content consisted in creating a “package” of alternated layers of soft iron and pig iron, softened and then hammered together to weld them and to diffuse the carbon from the cast iron to the soft iron, in order to obtain the desired carbon percentage and to achieve hardenable steel. In India and Far East there were other techniques based on the heating in a melting pot of particularly pure iron ore, glass and carbon. It was also known in ancient times the carburetion practice: the mild steel was wrapped by a layer of coal powder that was then ignited, therefore it acquired a high percentage of carbon dust in its outside while the core remained mild. They then proceeded to hardening. The technology has not essentially changed until the beginning of the sixteenth century when the blast furnace for the attainment of the cast iron became more and more important. They are furnaces completely outside the ground, the iron ores and the charcoal were alternatively introduced from the top, in order to reach such temperatures that generated melted cast iron that was then spilled from the bottom. At the beginning of the eighteenth century they also succeeded in obtaining cast iron by using pit coal and then compensating, especially in nations like England with scarcity of woods, to the shortage of wood. In any case the productivity was very good but the obtained material very fragile. It was used for castings but it was unusable for the plastic deformation. They were facing an opposite problem to that found in the previous centuries, it was necessary to decarbonize the obtained product through refining. Numerous solutions were tested starting from the seventieth century, but none of then were particularly productive and economic. The most interesting was certainly the so called puddling. The cast iron was heated up to the liquefaction in reverberation furnaces where the material did not come into contact with combustion products but it was exactly heated by the flame reverberation. The metal was continuously puddled by an operator, in presence of a hot air flow, to make it loose carbon and then to transform it into steel. 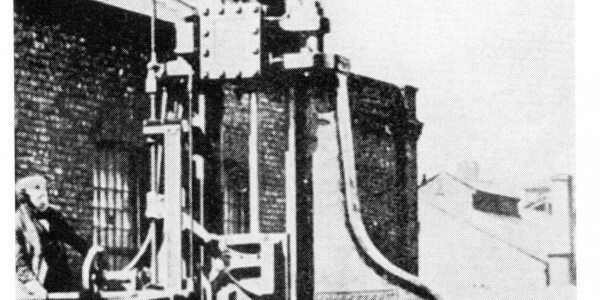 Fundamental was, in 1857, the introduction of the Bessemer converter (Figure 1) used in the industrial production of steel starting from the melted cast iron produced in the blast furnace. It was the first furnace that permitted the production of steel in a single machining phase. 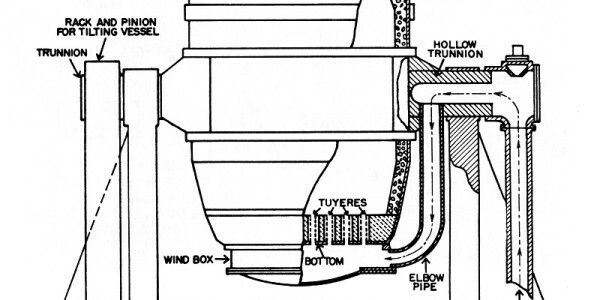 The operation is conceptually simple: a great quantity of air that crosses the bath is pumped from the bottom. The high carbon percentage, the high bath temperature and the oxygen contained in the air provoke characteristic blasts in which carbon is burnt thus diminishing the content in the bath and thus obtaining steel without adding further fuel! In the first times the process was not usable for the cast irons with high phosphor percentages (the majority! ), but afterwards a remedy was found to this problem, too. 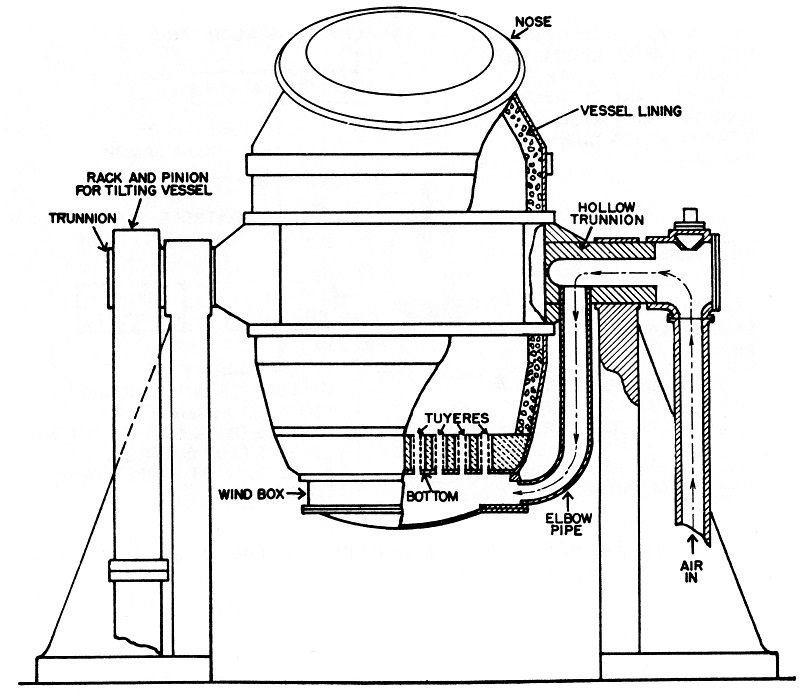 This technology remained in use until the Sixties when it was supplanted by an analogous one that uses oxygen breathed into the bath from above, the BOF (Basic Oxygen Furnace) process. Other developments were achieved with Martin-Siemens, electrical and continuous casting furnaces and many others but we have in the meantime arrived at our age. At present the most used technology to refine cast iron are the BOF process for the blast furnace cast iron and electrical furnaces to remelt the scrap iron, eventually mixed with cast iron. It is not easy to date the “first sheet metal”, certainly thin sheets of valuable metals were fabricated in the prehistory by cold working very ductile materials like gold and silver, hammering them with stones until were attained very subtle sheets that were then used to make jewels but also to coat the wood shields or to fabricate armour parts. Soft iron was only hot workable, then arousing particular problems for the attainment of thin thicknesses. The real turning point in the sheet metal production took place with the introduction of the rolling mill. 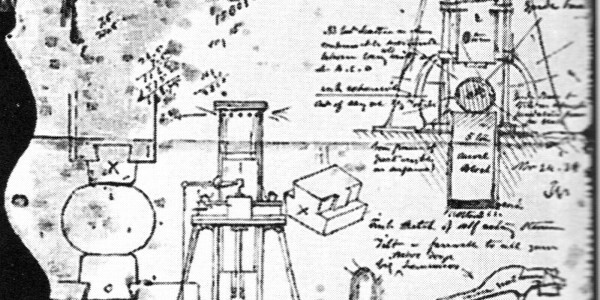 The first known design of a rolling mill dates back no less than to Leonardo who in one of his drawings, dated 1480 (Figure 2), describes for the first time the possibility of “making a material pass” between two cylindrical rollers with parallel axes to modify its thickness. Also in this case it was provided for the cold machining of ductile materials, especially for lead, tin etc but it is not certain that it was ever built. 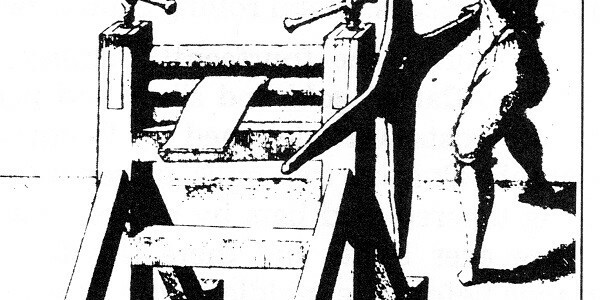 There are reports of two rolling mills in the sixteenth century: one used to obtain gold sheets with uniform thickness from which to draw coins, the second to cut already formed sheets into strips. Both were more used as “finishing devices” rather than to reduce the thickness. The first industrial plant of which we have certain news was used in 1615, to obtain lead and tin plates (Figure 3). Others followed, driven by animal or hydraulic force. Due to the increased possibility of obtaining ferrous material, the cold rolling of steel is simultaneously started. 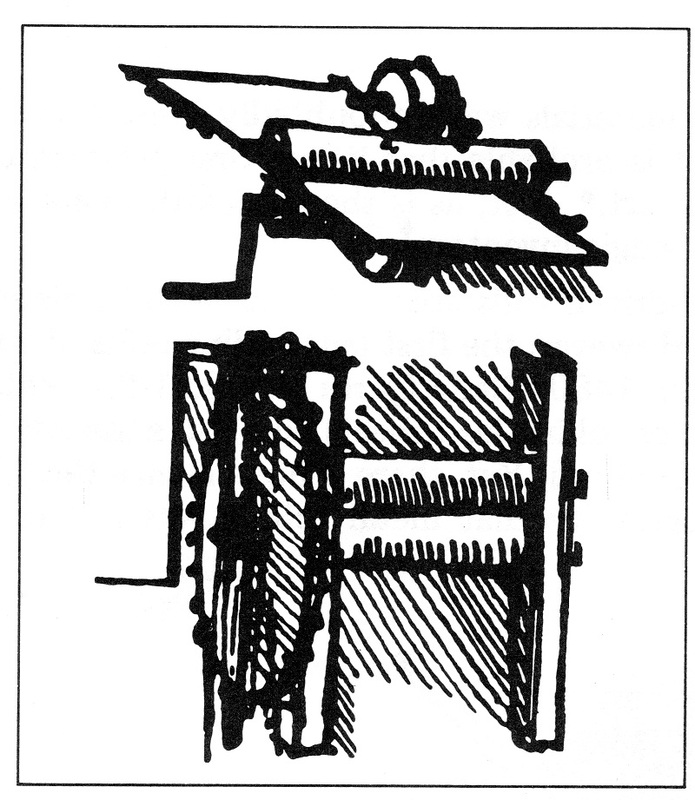 In 1682 a cold rolling mill of notable sizes was present in Newcastle in England. The first detailed description dates back to few years later; it is a plant in Galles that processed 700 mm-long bars with 100 mm width, which could obtain sheets with 1500×700 mm sizes, it is the first certain witness of the steel rolling process to produce sheet metal, the driving force was provided by water wheels (Figure 4). Galles will remain the main European producer of thin sheets until the end of 1700. In the eighteenth century they also started rolling more complex shapes: rounds, squares, rails, double-T beams etc. It is essential to observe how the rolling complies with the demands of that age producing the requested materials: in 1600 lead sheets for the roof covers were highly requested and this possibility is then developed, at the end of 1700, in the middle of the industrial revolution, they needed rails and semi-finished steel products that therefore the rolling promptly satisfies. 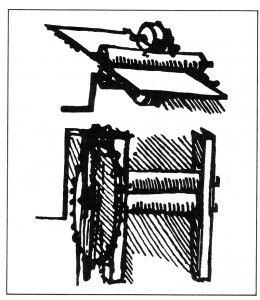 At the beginning of the nineteenth century the rolling mill structure was essentially the current one: a sturdy cast iron cage with two steel cylinders and the possibility of adjusting, through a screw, the roller distance (Figure 5). 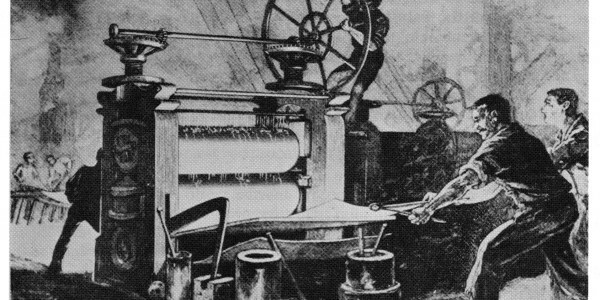 Already at that time they understood that the rolling was a very productive process able to satisfy the enormous quantity of semi-finished products, among which obviously metal sheet, which the historical time requested, even if the process still needed a conspicuous human labour use (Figure 6). The product sizes continuously increased, at the “British Great Exposition” in 1851 a sheet metal with over 6 metre length, 1 metre width and 11 mm thickness, weighing over 500 kg. was on show. 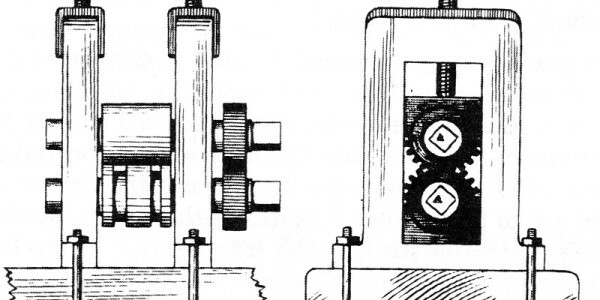 The driving force used evolves in time: after the hydraulic wheel, the steam engine and then the electric motor. 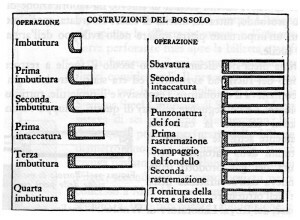 Other innovations concerned the number of cylinders: they passed from two cylinders to the “trio”, three cylinders in which the intermediate, with much smaller diameter, to diminish the requested power and to allow the rolling in the two senses without reversing the motion of the motor. 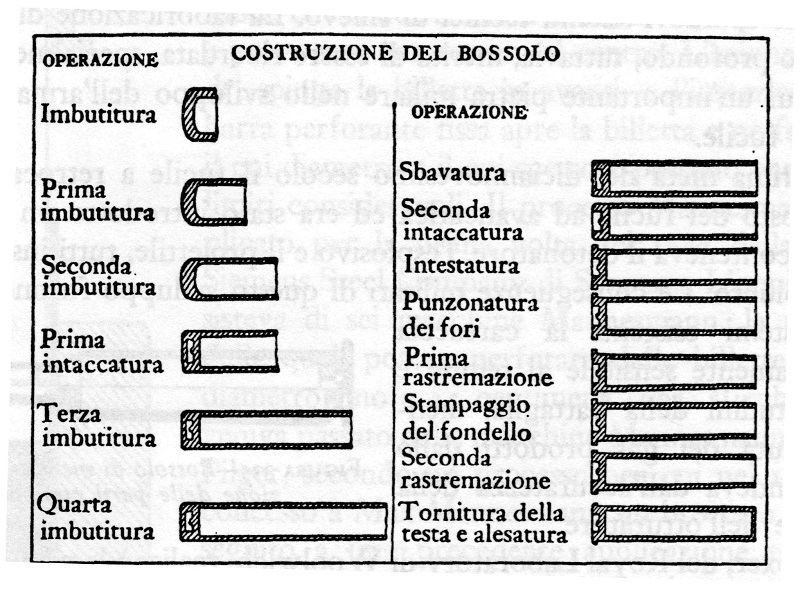 Up to the four-cylinder configuration (already hypothesized by the genius Leonardo da Vinci) with the two more external cylinders acting as support to the two internal ones that accomplish the machining, up to implementing the configuration with even 20 cylinders. In more recent times the evolution concerned especially the control techniques of plants, especially if in tandem, that’s to say in the cases in which, and they are the most numerous, the cage is not isolated but the rolled product directly enters the successive cage. It is anyway worth making a clarification: rolling, as we know it today, cannot be attributed to a single inventor (neither to our genius Leonardo!) 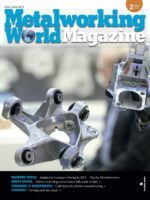 but it is fruit of dozens and dozens, not to say hundreds, of small continuous improvements that have led it to be the most used process in metal working. Let’s just consider that 90% of the metals used in industry, have, sooner or later, undergone a rolling process. Once obtained the precious sheet, it was necessary to work it cutting a part, and generally, deforming it in orthogonal direction as to the sheet itself, the process typically occurred (and still occurs) under cold conditions. Certainly, in the most ancient times, the sheet attainment phase and its machining coincided: a malleable metal was deformed hammering it with stones and simultaneously making it take the wished thickness and aspect. Only towards the sixteenth century, with the possibility of rolling materials, and therefore of obtaining relatively thin thicknesses at low cost, the two phases neatly separated. The sheet metal cutting has been typically executed since remote ages by using shears, that’s two say two blades positioned on parallel planes slightly offset each other (like in domestic scissors!). The technique has not conceptually changed until our times but it has notably evolved in the cutting capacity in terms of thickness and length, we passed from the manual one (big scissors), to the bench one, with a fixed blade and the other manually lowered by apposite levers up to the industrial ones, where the used driving force has evolved like in all other machines (hydraulic, steam, electrical). 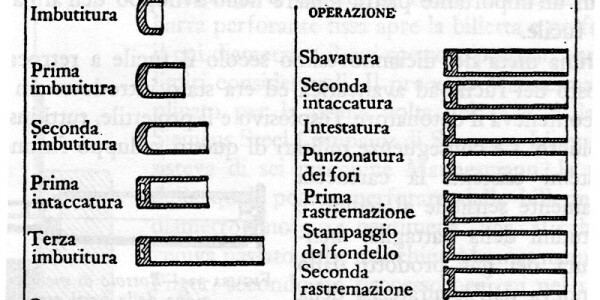 Dating all these innovations is anyway very difficult, since it was a continuous evolution without particular “jumps”. 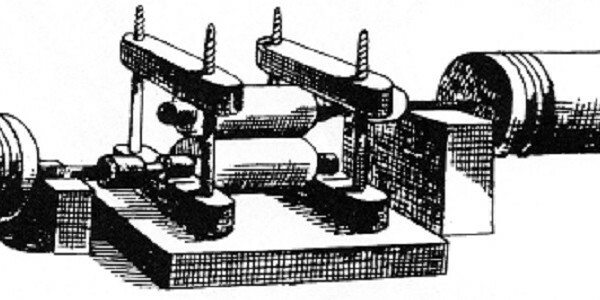 The punching introduction dates back instead to 1847 when, upon demand of road bridge builders, it was implemented the first machine able to execute a series of equidistant holes. Few years later, from this derived the nibbling machine that performs the sheet metal cutting through the execution of very close holes. Still at the end of the nineteenth century, for the cutting of big-thickness sheet metal, it was introduced the oxyhydrogen torch that used oxygen, hydrogen and lighting gas. They tell that it was used for the first time to burgle a safe! Over the last decades several other cutting forms have been developed: waterjet, LASER, oxygen cutting, plasma cutting etc. It is not the time of telling their history, yet! The sheet metal shaping has been accomplished for thousands of years (and it is carried out still nowadays!) through the hammering technique. The sheet is positioned on metal, wood or metal equipment, which reproduces the shape to be obtained, then through successive hammering it is «obliged» to adhere to the equipment reproducing its shape. It is clearly a very slow process, whose success mainly derives from the operator’s skills. The (not deep) drawing was an evolution notably widespread, even if it is possible that there are older examples, in the eighteenth century. The technique certainly derives from the coining one, known since the antiquity, in which a metal was placed between two dies and compressed by a hammer (or power hammer) stroke or a press. The successive step, using the sheet metal, was relatively short, still using two dies the sheet is interposed and they are closed with force by using presses. Obviously, also in this case the sheet metal «must» fill the die but it does it by plastic bending, leaving the thickness almost unchanged (that is instead deformed in coining), we might say that the deformation occurs only in two directions. It is worth underlining that die and counter-die are implemented «to respect» the sheet metal thickness. Great boost to this technology was given by the automotive industry in the first half of the twentieth century. The concept has not changed until nowadays, the force exerted by presses, and therefore the formable sizes as well as the complexity of the attainable shapes have however remarkably increased (you have certainly wondered why some decades ago cars privileged “flat” shapes and not the current ones, so sinuous!). 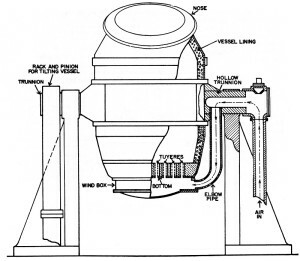 At the beginning of the nineteenth century the steam hammer appears, steam was used, for the first time, as driving force to lift the ram and in the following years, with the double-action hammer, also to increase the descend speed (Figure 7). 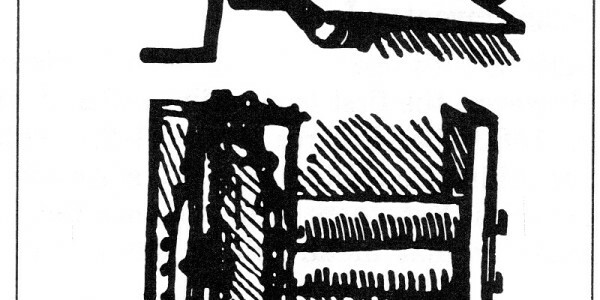 Deep drawing was instead born at the end of the nineteenth century for the fabrication of ammunition shells. The machining cycle provided for (Figure 8) the use of a brass strip with 3.5 mm of thickness, where it was first of all sheared a disk in which the first cup was obtained by deformation. Afterwards the latter was annealed and pickled and then drawn again with smaller and smaller dies and punches. In the last stages annealing was not executed to leave the material work hardened and then more resistant. It was then introduced also the concept of follow dies. The process has been extended also to other uses like the attainment of small tubes with subtle thicknesses but also of pots, washing basins etc. In the successive years the process has remained conceptually unchanged, they have been obviously varied, increasing them, the sizes, the drawing depth, the quality (absence of defects) of the final product. Obviously, what here described is not exhaustive, there would be several other things to say and several other technologies of which to narrate the history! As you can see, the sheet metal history has accompanied human civility’s, substantially taking part in its development. Since ancient times it has in fact always played a primary role in all technological progresses, contributing in them but also taking advantage of them. It was able to constantly evolve meeting rapidly the needs that variable socio-economic conditions requested in the various ages, improving, thanks to its flexibility and cheapness, life conditions. Today, despite the really numerous alternative materials (see polymers) that have approached the universe of the production engineering, it still plays a fundamental role. We cannot certainly stop, we still expect numerous developments both from new technologies (LASER, hydroforming, incremental forming etc.) and from the more consolidated ones (shearing, punching, bending etc. ), as well as several were the research activities to be able to understand fully its behaviour better and better and to tame our “wild” sheet metal. As always: he who hesitates is lost! Great Article mate !! its truly said metals are the king and still they are improving like carbon fibres that are even more reliable. What you think?